This spacious and attractively furnished 10 person holiday home is situated in the heart of the Frisian village of Delfstrahuizen near the Tjeukemeer. The terrace and live-in kitchen enjoy good views of a bridge and boats on their way to Lake Tjeuke and the Weerribben National Park. You can enjoy delightful walks and cycle trips in the surrounding area. Water sports and ice-skating in the Thialf ice-skating stadium are a possibility. The Weerribben National Park is around 15 kilometres away. You can explore the park's beautiful countryside by canoe and 'Whisper Boat'. Bicycles, motor boats and sailing boats can be rented in the village. The village has pleasant restaurants, pavement cafes and shops. 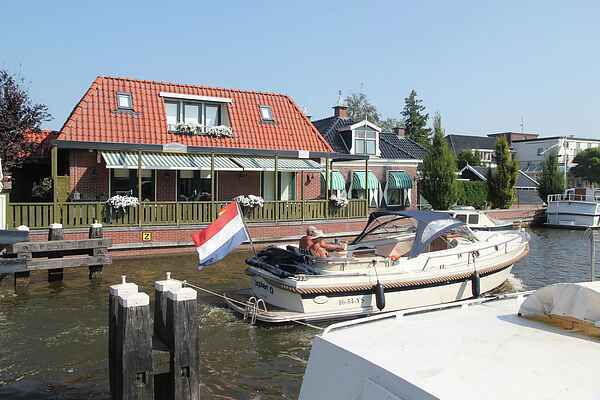 The towns of Heerenveen, Joure and Lemmer are just ten to fifteen minutes away by car. Please note: The double cupboard beds are 1.40cm x 2.00cm. If you need fewer beds you can check the Belvilla website and have a look at the Meervaart-the Tjalk (NL-8508-04).